Well, that didn't take long. 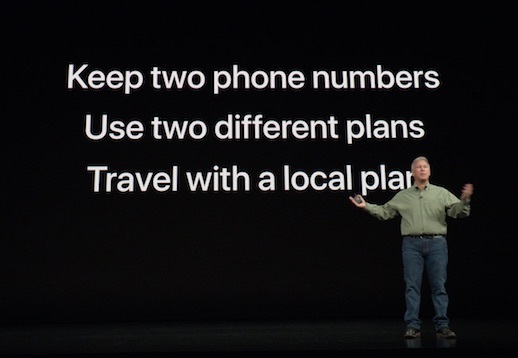 Owners of new iPhones can now download an app and stick some data and minutes on the second SIM that Apple has thoughtfully included, allowing cheap calls and roaming data that your main SIM provider might not include. The UK's veteran virtual SIM pioneer Truphone was the first to break cover, providing an app to manage the eSIM. For now, Truphone is focusing on data rather than voice minutes, although calling will come – so it envisages the second SIM slot being used by travellers for roaming. The international data plans allow flat rate roaming in 80 countries (but not China) using pre-purchased data plans. The advantage is that you don't have to scramble around to get a local SIM when you land at your destination – it's already active. Rates for eSIM plans acquired in the UK are 300MB for £6 a day, 1GB for £15 or 3GB for £42. Naturally, your existing network operator may offer a better deal – but then again, it may not. Many will have a basic SIM with no provision for discount data when roaming in India or the USA – two countries covered by Truphone. Apple added a secondary eSIM slot (except those sold in China) to all three of its new iPhones back in September. Truphone thinks eSIMs are a "game changer" and they may well be right. Knowing that the punter can switch on a second SIM very easily may oblige your main MNO to be more competitive. Palo Alto-based GigSky has also launched a similar service for roamers. Like Truphone's, it's administered through a self-service app. Disruptive Wireless analyst Dean Bubley recently cautioned that an eSIM-only world would be neither very desirable nor practical. Don't expect the feature to filter into budget phones very soon, he added.